It is almost customary for Ruskin Bond to surprise his readers with a subtle reference to his childhood. The readers on the other hand -- having devoured much of his works -- prefer to assume that they know all about the life and times of this timeless writer. Every time you think you know enough about the writer, adored so dearly across the country, there is something new that he throws at you. The elegance with which he does so is perhaps what keeps us intrigued about the life of the author, who has been writing for well over six decades now. What do we already know about Bond's early days? That he did not have a very happy childhood, that his parents were separated and that he was often lonely. But one splendid year from Bond's life escaped the public eye and this memoir, releasing on his 83rd birthday on May 19, takes readers back in time and lays bare the sheer joy that the then eight-year-old boy had with his father. In the foreword, he impresses upon the fact that sometimes memory improves with age and he now remembers things that he thought he had forgotten. "Most of all I remember my father -- 'Daddy', as I always called him." Bond seduces his young readers by repeatedly capturing a boy's state of mind and reminds the elders that kids are particularly looking for "tenderness" from those they love. In this context, he says that not many fathers succeed in providing this tender care to their children because "they are usually too busy earning a living for the family". Bond, fortunately, was lucky to have Aubrey Bond as his father, who gave him nearly all his spare time, shared his interests and held his hand in the dark. The ease with which he fits into the shoes of an eight-year-old boy and yet succeeds in maintaining the perennial charm associated with his vivid writing is commendable. The memoir's narration is from the 83-year-old Bond's perspective, but the imageries that he creates are all straight out of the eyes of the eight-year-old Rusty. He does not travel to and fro, rather it is a simple narration that starts in 1942 when he arrived in Delhi after leaving his school in Dehradun, and ends on a tragic note shortly after he joins a new school a year later. 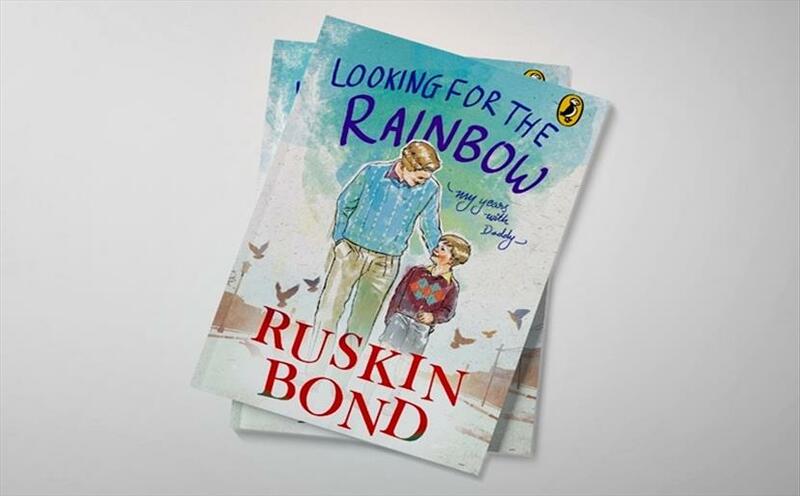 In "Looking For The Rainbow", readers are taken on an exciting ride down memory lane and elaborately told about the one year that Bond spent with his father in Delhi, having escaped his "jail-like boarding school in the hills". This period is full of books, visits to the cinema, music, walks and conversations with his father -- a dream life for a curious and wildly imaginative boy. But all of this turns tragic too soon. He arrived in Delhi in the middle of World War II, the period when his parents too "had been at war with each other". His father was serving in the Royal Air Force and was living in an Air Force hutment on Humayun Road in New Delhi. It was during that summer that Bond saw his first snake, went for walks up and down the ramparts of Red Fort, stored drinking water in an earthen jug or sohrai, and was quite happy to be on his own while his father was away at work. When the father-son duo were together, they went for movies and spent time arranging stamps of his father, who was an avid collector. But that was not all, his father always made him breakfast before leaving for office. A couple of toasts with a half-boiled egg, occasionally a sausage, lots of jam and lots of tea with condensed milk were what the "greedy little boy" preferred. The little boy goes to a boarding school again and makes some good friends too. And then one day, his teacher, Mr. Young, was handed over the unenviable task of giving him the bad news. "'Your dear father,' he stammered. 'Your dear father -- God needed him for other things.' I knew what was coming and I burst into tears. I had no one else in the world -- just that one dear father -- and he had been snatched away. We had been taught that God was a loving, merciful being, and here he was doing the cruellest possible thing to a little boy," Bond recalls. An extraordinary offering by India's most loved author, the book captures the little nuances -- fantasies, expectations and often void -- that children face but remain largely unknown to their guardians. The book has been beautifully illustrated by Mihir Joglekar and is published by Puffin India.